Don’t be fooled – although the cover looks rather young, with doodled drawings of personified socks and plants and a dog, with letters scribbled on and made to look pretty, this is a far deeper book than first appearances suggest. It purports to be the memoir of Jacques Papier. Unfortunately for Jacques, everyone seems to hate him, from the family dog who barks incessantly at him, to his classmates who fail to pick him for a team, from his teacher who ignores his waving hand when he knows the answer to the question, to even his parents who need to be reminded by his sister Fleur to set a place for him at the dinner table. Cuevas questions theories of the self, in that Jacques can’t look in a mirror to see what he looks like, he is only seen through someone else’s eyes. 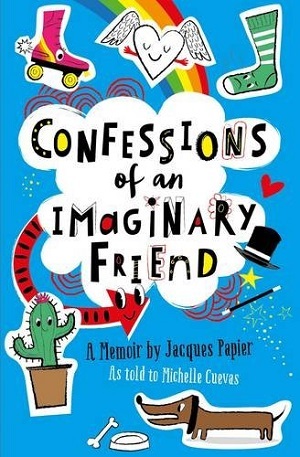 This is funny for children, as Jacques becomes other children’s imaginary friends – changing shape into what they imagine – for instance he does end up as an imaginary dog at one point. Some of the humour is aimed directly at the adult reader though – the imaginary friends have their own ‘Imaginaries Anonymous’ support group, into which Jacques is recruited while waiting in a psychologist’s (who deals specially in imaginary friends) waiting room. He also has a stale cookie and fruit juice at the end of the meeting. Other more adult wit includes Fleur’s father’s attempt to get Fleur to discuss her feelings using puppets, and the Office of Reassignment where imaginary friends go to fill out forms and find a new ‘real person’ to imagine them. The office has its own helpline too. Jacques goes through quite an adventure to reach a satisfying conclusion, staying with various children in different imaginary friend guises, including staying with a boy called Bernard who feels more invisible than his imaginary friend. This gives Jacques a raison d’etre – he can help someone else become more visible. Bernard’s father also introduces a further facet – interesting facts about animals being able to see more than us, because they have more cones within their eyes. A fascinatingly humorous book that makes you question yourself and the world around you, and employs a rather jolly plot to do it. An excellent read. For 9+ years. You can buy it here. Thank you to Simon and Schuster for sending a review copy.